The population of New Jersey was 8,791,894 people in the 2010 United States Census, ranking it as the eleventh most populous state and representing a 4.5% increase from the 2000 survey. The Census Bureau's annual estimate of change was that the state population grew to 9,005,644 as of July 1, 2017, representing a 2.4% increase from the 2010 Census. As the fourth smallest state in land area (behind only Rhode Island, Delaware and Connecticut), New Jersey has the highest population density of all states with 1,189 residents per square mile. As of fall 2016, the most recent available data were of 103,203 births in 2015 and 71,316 deaths in 2014 in the state. 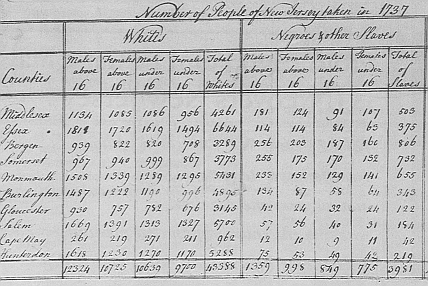 In the first national census in 1790, New Jersey was reported to have 184,139 citizens, a population density of about 25 persons per square mile compared to the 1,210 persons in the 2010 Census--the highest density of all states. 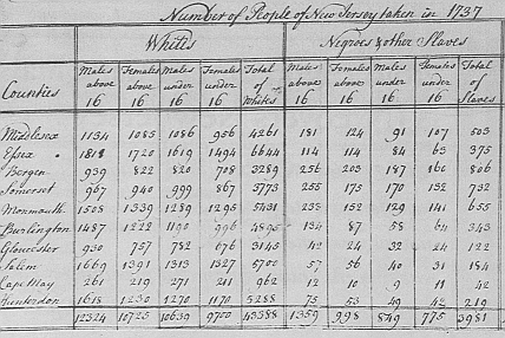 The primary sources of foreign immigration to New Jersey have increasingly been shifting from Europe to Latin America and Asia, but the five largest ethnic groups in 2000 continued to reflect the historical pattern, with the largest groups comprised of Italian (17.9%), Irish (15.9%), African (13.6%), German (12.6%) and Polish (6.9%). The Spanish language, with 14.59% of households speaking it as their primary language at home, is by far the most frequent language spoken other than English, with Chinese (1.23%), Italian (1.06%) and Portuguese (1.06%) the only other languages exceeding one percent. In 2017, the annual survey published by United Van Lines reported that of all states New Jersey had the second largest outbound movers at 63%, just behind Illinois which also was reported at 63%. New Jersey previously held the top spot for 5 consecutive years. According to an analysis of IRS tax and migration records, from 2006 to 2011 the state lost more than 90,000 taxpayers--and some $8 billion in income--to other states and countries which was not made up from new workers within the state. New Jersey's religious composition was 67% Christian; 14% non-Christian; and 18% unaffiliated (atheist; agnostic; nothing or don't know), according to the 2014 Religious Landscape Study of the Pew Research Center. Among Christians, 34% are Catholic and the overall the state has the highest proportion of Catholics at 38%, second only to Rhode Island's 44%, according to the American Values Atlas. 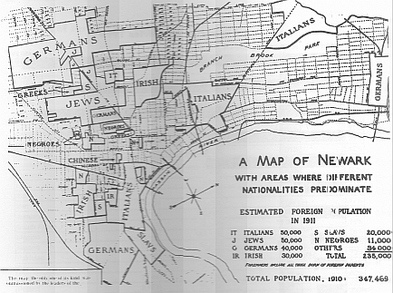 The New Jersey Jewish population of 516,470 is 5.8% of its 2014 population (second highest after New York state). It has the second largest percentage of Muslims in its population of .9% (after Michigan). With 109 mosques in 2011, it tied with Illinois for the fifth highest number of all states, behind first-ranking New York with 257. The city of Paterson was estimated to have 25,000 to 30,000 Muslims as of 2011. Between 2000 and 2014, the state population grew at an annual rate of .4%, less than half the national growth rate. Population growth is projected to average 0.6% annually from 2014 to 2025, compared to 0.8% for the nation as a whole, with the state's share of total US population expected to fall from 2.8% in 2014 to 2.6% in 2045. By 2045, the state's total population is projected to be just over 10 million residents. According to a survey taken in February 2015 by the Monmouth University Polling Institute, more than 6-in-10 New Jerseyans say the state is either an excellent (15%) or good (48%) place to live, while 25% rate it as only fair and 11% as poor. Positive evaluations of one’s hometown as a place to live were 72%, with 62% of residents reporting that they felt very safe in their own neighborhood at night. Positive evaluations of local public schools were 61%, with evaluations of local environmental quality at 72% positive.